In many Wing Chun circles there is much talk about what is proper chi sao vs what is not proper chi sao. If we look on YouTube we find tons of samples of people doing bad chi sao or worse people thinking chi sao is actually sparring. In a previous article I talked about What Is Chi Sao. In this article I want to show you what I feel chi sao should look like. I am not a big fan on filming myself doing kung fu. However, my sifu did a really good lesson on it and I wanted to do the intro to the the lesson justice. While Chi Sao isn’t exactly fighting if you are practicing with an aggressive partner you can experience a real adrenaline dump. These things are nasty. Your body locks up in many cases you even get scared. Essentially when an adrenaline dump happens your chi sao skill goes out the window. Chi Sao training can help teach you breath control and pressure control. Only a novice practitioner thinks chi sao is actually fighting. Besides the fact that in Chi Sao you start with your hands connected, in a real fight you are not connected. Chi sao has fixed patterns, therefor depending on your partner you could be training repetition rather live energy. So there are many factors that go into chi sao. Make no mistake though, a person who is very good at chi sao is also more than likely a very competent fighter. In order for Wing Chun to work, a wing chun practitioner has to use their skill vs using brute force. Wing Chun is a counter attacking system. 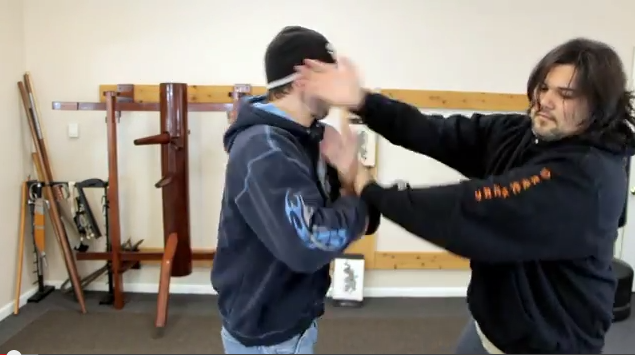 I know you see lots of videos online where wing chun fighters are doing the attacking. I don’t believe it’s how it was meant to be used. Wing chun is devastating from a counter attacking position. The skills you learn in chi sao can be applied the moment the energy calls for it. As Bruce Lee said, when it attacks it attacks all by itself…….